This is one of the most amazing instruments I've ever played. I owned a couple of X500s and felt like they were going to be too much guitar for me, but I don't get that feeling with this guitar at all. I'm not entirely sure why yet, either. I read in one of the catalogs that the back is made from wood usually reserved for making cellos. It sure is beautiful, but I think that kind of explains why it feels so different. When I was in high school I played in orchestra and band and was generally surrounded by music. I lived in a nice area and so some of the kids had some pretty killer instruments. I think that this guitar reminds me of a really well-made cello. It's somehow on another level than the normal stuff I play, and that goes for those X500s, too. They're not even in the same ballpark. The guitar came with flat-wounds and I generally dislike flat-wounds. But the guitar sounds SO good that I can't imagine changing anything. It's refined and elegant. The nicest acoustic I have is the DV72, and that's a pretty killer guitar, but compared to this it's just a guitar. This is an orchestral instrument. Oh, that is a tease! Beautiful! Looking froward to more tasty photos! Congrats, Gary! Great guitars can really elevate you; you’re not fighting them and they seem to make everything easier. Thats always been the paradox in music education. Student instruments are so bad, that they impede a young player. Yet, unless they’re extremely lucky (or rich), they don’t get the chance to play on something that will make want to play more and get better. The flip side of that is that after learning the basics on a "crappy" instrument (whatever it is), you will feel like you have wings and you can fly once/if you acquire one of a better quality. Congrats Gary, I'm sure that guitar must feel awesome in addition to being gorgeous. Stunning, GAD. Fabulous wood and extraordinarily beautiful sunburst! 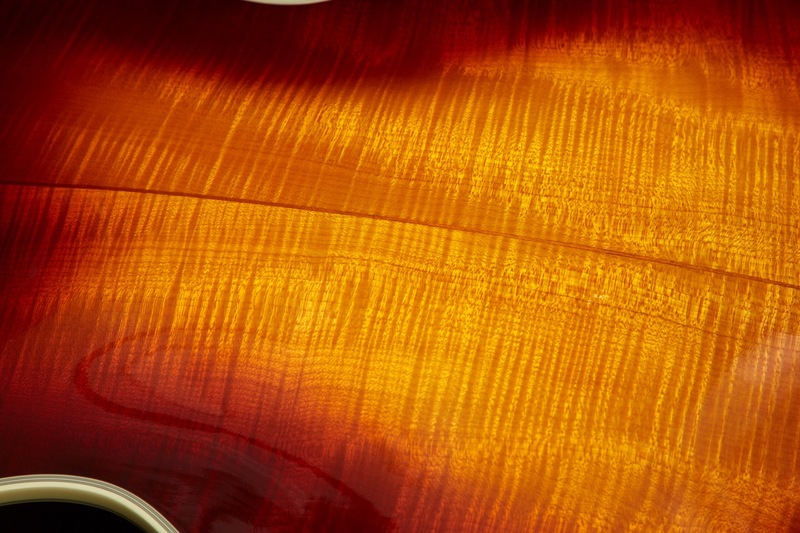 But, yes, while fiddleback maple is commonly used for classical instruments, you see it all the time on guitars as well. I think the great care and attention that the Westerly folks gave to the build of this instrument is responsible for it's outstanding sound. More than the uniqueness of the maple used in its construction. I could be wrong, though. No matter what, that looks like a treasure, man! I know how you feel, Gary. My experience is the same. Although I must say my '47 Epiphone Broadway, also with the DeArmond 1000 gives my '66 AA a run for its money. The back of my AA is equally beautiful. The guitar is so well balanced, acoustically, electrically and weight wise. P.S. When I return from India on the 15th Feb, I'll post pics of my new acquisitions. Last edited by Rich Cohen; 02-05-2019 at 02:12 PM.